In this issue: new America full of magic and mayhem, an alien threat brought back from extinction, and an Honor Harrington classic. All that plus a new contest! 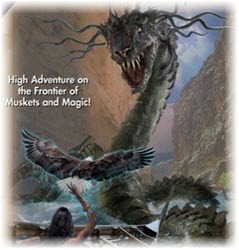 High Adventure on the Frontier of Muskets and Magic! It is 1803—a new 1803. Young Meriwether Lewis, footloose and intrigued, goes to hear a lecture in St. Louis by the venerated old wizard Benjamin Franklin. Franklin’s talk is disrupted by the attack of a winged fire-breathing beast. In the aftermath, Franklin tells the young man that he knows of a great, growing evil that lurks in the uncharted Arcane Territories west of the Mississippi. Using his own vast fortune, Franklin commissions Lewis and his partner William Clark to embark on a voyage of exploration. Accompanied by the brilliant shape-shifting sorceress Sacajawea, Lewis and Clark set off on an unparalleled adventure across a landscape that no European has ever seen. The war with the Arduans has ended, and the Arduans have come to call humanity their allies. Most of them—the Arduan warrior caste refuses to accept defeat. 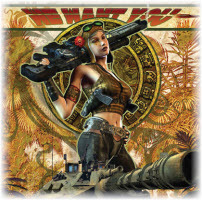 Now known as the Kaituni, they are waging a war of extermination against all members of the pan-Sentient Union. What’s more, the Kaituni have an unexpected weapon in their arsenal: the alien Arachnids, once thought driven to extinction. The Kaituni drive the Arachnid fleet ahead of them, inflicting untold damage. The odds look bleak. But Admiral Ian Trevayne and Commodore Ossian Wethermere have faced down long odds in the past. It’s time to take a stand, for Earth, for humanity . . . and for the pan-Sentient Union! In Uncharted, Lewis and Clark set off to explore the western territories belonging to the United States of America. But in this timeline, they’re going to encounter monster, magic, and mayhem! Which got us thinking, what other explorers from world history would you like to see reimagined in a fantasy setting and how might things play out? Would Christopher Columbus discover that the world really was flat? Would Marco Polo encounter serpentine dragons on his way to China? Let us know in a short paragraph (100 words or fewer) for a chance to win a signed copy of Uncharted. To celebrate the release of Witchy Winter, which takes place in an alternate America where magic works, we asked you how some of America’s beloved patriotic songs might sound with a fantasy twist. You all had us whistling “Yankee Doodle”, but in the end we had to narrow it down to just one winner. So congrats to Wayne Ligon! He wins a signed copy of both Witchy Eye and Witchy Winter. 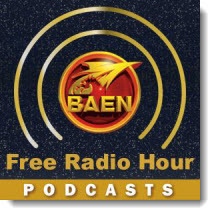 Coming soon to the Baen Free Radio Hour: A roundtable discussion with David Weber, Honorverse BuNine consultant Chris Weuve, Royal Manticoran Navy fan club Grand Admiral Martin Lessem, con liaison Anton Petersen, and BuNiner Arius Kaufmann discuss interaction of authors, readers, and fans, especially when it comes to David Weber’s Honorverse. 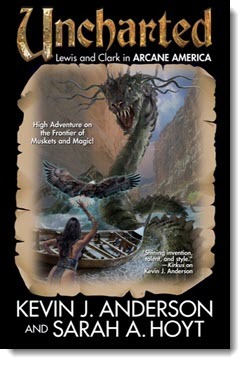 Plus, Kevin J. Anderson and Sarah A. Hoyt on flintlock fantasy Lewis and Clark expedition novel Uncharted. Missed past episodes? No problem. We’ve got every episode archived for your listening pleasure. It is 1803—a new 1803. When a lecture by the venerated wizard Benjamin Franklin is disrupted by the attack of a winged fire-breathing beast, Franklin commissions a young Meriwether Lewis and his partner William Clark to investigate a growing evil that lurks in the uncharted Arcane Territories west of the Mississippi. For eight bloody years, the Star Kingdom of Manticore have taken the war to the vastly more powerful People's Republic of Haven, and Commodore Honor Harrington has been in the forefront of that war. But now Honor has fallen, captured by the Peep Navy, turned over to the forces of State Security . . . and executed on the interstellar network's nightly news. But all is not lost, for what no one knows is that Honor Harrington is not dead. The war with the Arduans has ended, but the Arduan warrior caste refuses to accept defeat. They are waging a war of extermination against all members of the pan-Sentient Union. But Admiral Ian Trevayne and Commodore Ossian Wethermere have faced down long odds in the past. With the Earth in the path of the rapacious Posleen, the peaceful and friendly races of the Galactic Federation offer their resources to help the backward Terrans—for a price. Humanity now has three worlds to defend. As Earth's armies rush into battle, the humans begin to learn a valuable lesson: You can protect yourself from your enemies, but may the Lord save you from your allies. 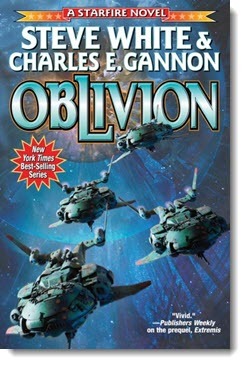 First time in trade paperback. Don't forget to check out the newest ebook releases here. 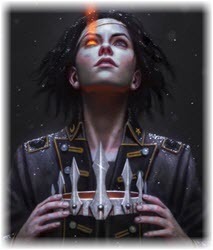 Plus a new short story “Father Avenir and the Fire Demons of Yellowstone” by Kevin J. Anderson and Sarah A. Hoyt here. And read this month’s nonfiction essay, “Fixing Broken Memory” by Dr. Robert E. Hampson here.